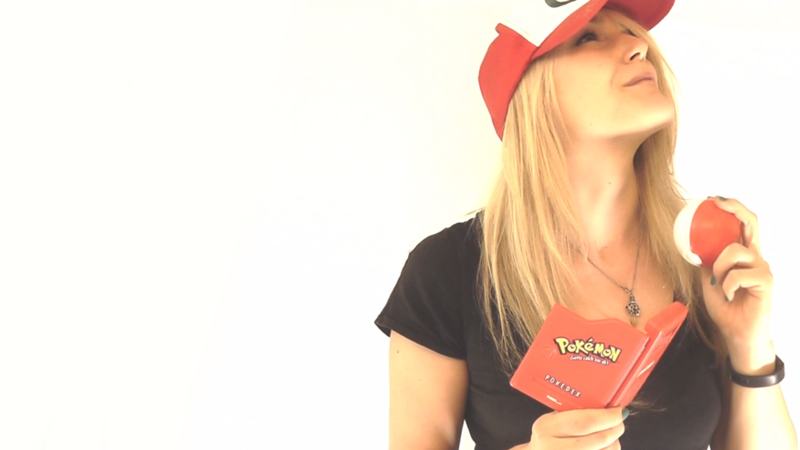 This week, we’ll be talking to the awesome Rachel Quirico, or better known as @Seltzer_FD. She’s a Frag Doll, a PC/Xbox 360 gamer, the Esports journalist for Cyber Sports Network and recently hosted the Smite Launch Tournament in Atlanta, Georgia. Her next hosting appearance will be at the Lone Star Crash 3, featuring Starcraft II and League of Legends in Austin, Texas this May 3rd and 4th. Thank you for taking the time to talk with us, Rachel. What inspired you to get into gaming? Can you tell us a little bit about your gaming background? Thanks for the opportunity! There was never a big turning point in my life where I really “got into gaming.” My parents were and are really fun people, and my mom was the first to show me video games. We had Crystal Caves, a space-themed platformer, on a floppy disk, and I was too young and anxious to play on my own, so she would play and I would freak out behind her. Growing up, my brother and I always managed to secure the major consoles as they came out, and we’d play Mario Kart as a family, and tons of other games on our own. In middle school and high school, too, gaming was the common ground I shared with a lot of my friends. I gamed semi-competitively thru college in Team Fortress 2 and some other games, and then decided to wrap school up early and shoot for a spot on WCG Ultimate Gamer. It’s been a blur of esports events and computer screens ever since. Which are your favorite games? What game left the biggest impression on you? If 10-year-old me knew how much I would end up talking about Pokémon in my fledgling adult life, she’d beam with pride. Looking back though, it was the first real imaginary journey I went on. Sure, I’d read the Chronicles of Narnia and I’d dressed up as a Power Ranger, but playing as myself, on my own journey to become a Pokémon master, really resonated with me. It gave me a whole awesome imaginary Narnia where I spent long car rides and late nights exploring. I learned to look for clues, follow directions, push my limits, and strive for success while maintaining human kindness. All I want is to one day play another game that creates as complete of an experience and as deep as sense of wonder as my early days playing Pokémon on Gameboy. What is your favorite aspect of shooting games? Which is your funniest play/kill? Shooters know how to make you feel good, and that goes double for decadent console fare like Call of Duty and Titanfall. It was fun in Team Fortress 2 when you’d put on Birthday Mode and people would explode into balloons and cheers. That’s what it feels like every time I accomplish anything in CoD/TFall. Grenade kill? AWESOME. Jump kick? SICK BRO! Fall 1000 feet to your death. WAY TO GO! It’s a huge confidence boost, even when I’m doing terrible. As far as hilarious kill stories…it’s hard to do them justice with words alone. Even harder because I have a terrible memory for stuff like that. The funniest thing I remember was the guy at VGXPO who got suuuuuper mad that he couldn’t beat me on this Quake map for a Sapphire-sponsored booth shoot-out. On the last day, he came in with his own mouse, mousepad, and keyboard, got spanked harder than ever because screw him, and left so furious he wouldn’t shake my hand. 10/10 Would crush his dreams again. Which game or genre do you really like but are embarrassed to talk about? Nobody ever really needs to know how much time I’ve sunken into one cartridge of Pokémon Pinball over the last 15 years. Gotta catch ‘em all, naw mean? Which is your favorite cosplay outfit that you’ve made? Duo Maxwell from Gundam Wing was my favorite character to cosplay, but I’ve gotten the most mileage out of my Hogwarts uniforms. 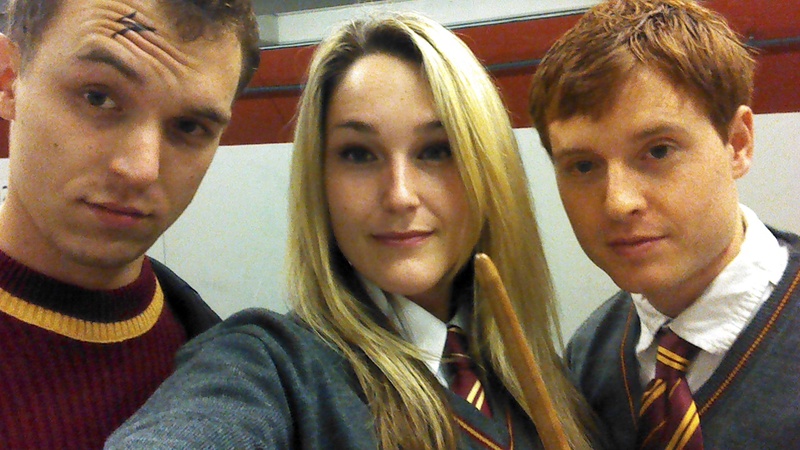 My boyfriend makes a perfect Ron Weasley, and until recently I was curly-haired brunette. It was destiny. We still drag the outfits out for Halloween! It seems that you’re pretty big on Christmas and Halloween. Which is your favorite holiday and why? Who doesn’t like presents and candy? Having worked in a mall for several years, I’m actually pretty anti-xmas. I hate all the music and the sappy movies. The traffic is monstrous. Red and green are, like, the ugliest colors together. And nativity scenes….super creepy. Really I only get excited because I like to buy gifts for people and then watch them open ‘em. That, and spending time with my awesome family. Halloween is way more my style. I love dressing up in costumes and going about a regular work day alongside other people in their costumes doing their regular work things. Peoples’ personalities really shine through in their costume choices too. It’s just a whole weird ridiculous day. What are your biggest and most personal accomplishments as a gamer? In competitive gaming, it was working with my team in TF2. We pulled together some sweet victories, like at the CTRL-ALT-DELETE Lan where our opponents in the finals forfeit after one round, and at NVision 2008 in the BYOC, when the tourney was delayed so long we stayed up a full night before we played. It’s hard to keep a team of 6 working well together, but we all always got along great, and I’m good friends with several teammates like Bunny and Joyrok still today. For gaming in general, I’m always striking little things off my bucket list. Hosting landmark esports events like Starcraft 2 WCS 2012 Europe Finals and the first League of Legends World Championship felt natural in the moment but left me feeling humbled by their magnitude in retrospect. By contrast, with Ultimate Gamer, I was so green that every call-back, every moment I was not kicked off the show, felt like the greatest moment ever. And when I was kicked off, I had accomplished all I’d set out to do, and I felt a huge relief. After all, I’d only cried on camera twice (thrice?) and had for the most part avoided any reality tv drama by being nice to everyone and feeding them twice a day. How did you become a WCG Ultimate Gamer? And how did you learn about the Frag Dolls? The Frag Dolls were founded in 2004, and I desperately wanted to be one starting probably in 2006. Even before I joined PMS Clan, where graduation in Frag Doll-hood was every girl’s dream, I had written about the team in papers for college. Also in those college papers: my CGS idol Vanessa Artega (who I knocked off WCG UG…THE FEELS BRO), my ideal wife Cassandra (who eventually saved me from a giant white cockroach one time in NYC), my industry mentors Valkyrie/Athena & AthenaTwin (Amber got me into my first bar when I was 18 and still gets me into Twitch parties today. Amy is now my boss at The Next Level at Ubisoft! ), and TossGirl (I WILL MEET YOU ONE DAY). It’s weird how my idols became my friends, but as I integrated into the industry, it happened naturally. I’d applied to Frag Dolls a couple times over the years, but gave up the dream when I decided to focus on interviewing and hosting instead of competing. When they reached out to me last fall, it was a shock. I was 18 and giddy all over again. For April Fool’s Day, you pretended to have dyed your hair. Would you actually consider dying your hair blue? I have wanted a full head of Articuno-blue hair my whole life (so I could look like my mary-sue fanfiction character who is AWESOME). Unfortunately I’d probably lose a few gigs if I tried that now, but the temporary blue made me really happy. I’ll probably try some more (temporary!) colors again soon. Is there any advice you’d like to give to future gamers? Growing up, I sunk my time into all sorts of weird things, like clay sculpture and comic book drawing and fanfiction writing. When I exhibited a new and all-consuming passion, my mom would always encourage me, and she would say, “Rachel, you can do whatever you want, as long as you can make a living.” So I would sell my art at craft fairs, submit my writing for scholarships, and eventually turn endless nights of me and my boyfriend screaming over Ventrilo into two stable careers in competitive gaming at top-tier publishers. So my advice is find something you love, and then find out how it works, and then find out how you can help. The world doesn’t need people who can play video games all day, the world needs people who can code, render, script, market, and appraise games. If you love gaming, cultivate it! I just want to say thanks for reading. 🙂 You probably have a lot going on in your day, but you stuck around to read my Pokémon ramblings and slog through my Ultimate Gamer reminiscing, and that means a lot. Cheers. Also, much love to my friends and family. Writing answers to these questions really makes me reflect on how fortunate I’ve been to have so many positive influences in my life. Thank you for your time, Rachel and thanks for checking out Gamer Compatible! 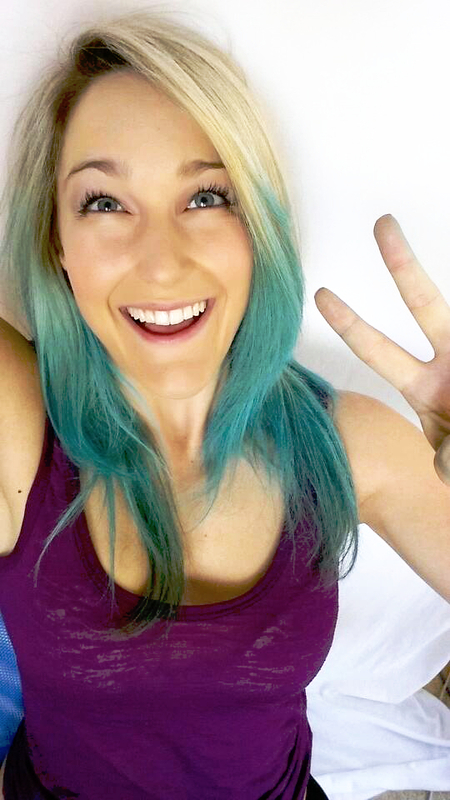 If you want to know more about Rachel, you can follow her on Twitter: @Seltzer_FD. And if you want to read more exciting gaming interviews, you can follow us on Twitter: @gamercompatible. 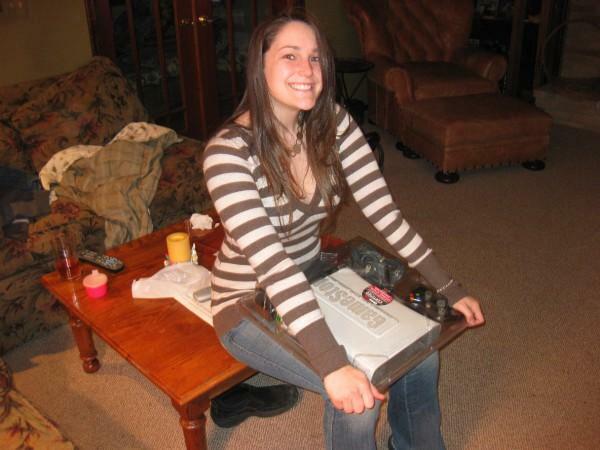 This entry was posted in Interviews and tagged cyber sports network, esports, exclusive, gamer, host, hostess, interview, journalist, lone star crash 3, pc, pokemon, rachel quirico, seltzer_fd, smite launch tournament, weekly, xbox 360. Bookmark the permalink.